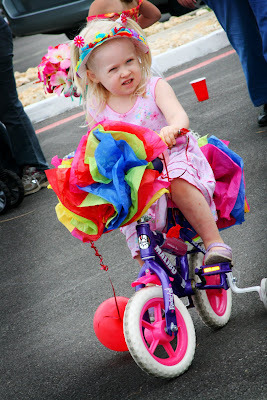 D'arcy's preschool held its annual FIESTA parade in their parking lot on Thursday. FIESTA is a weeklong celebration here in San Antonio. Their is an oyster bake, plenty of fireworks, a carnival, lots of turkey legs, a couple of parades, and of course cascarones (eggs shells filled with confetti). Preschoolers aren't left out of the fun. D'arcy's school asked all the students to decorate their bike, scooter, or wagon as a FIESTA float. The parents and grandparents are invited to come and watch the kids ride their floats around the parking lot. D'arcy actually had a grandparent to bring since Grammy was in town to meet Schroeder. This year, after a little bit of a traffic jam, the parade started and the floats were fabulous!